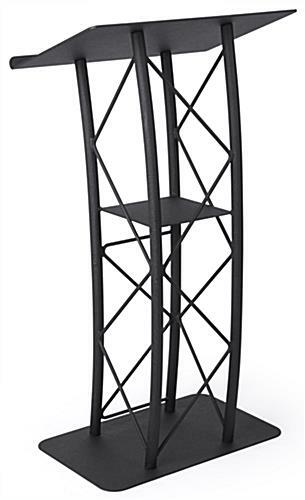 This curved truss lectern features a modern open-work design that will give a contemporary look to any professional or business facility. 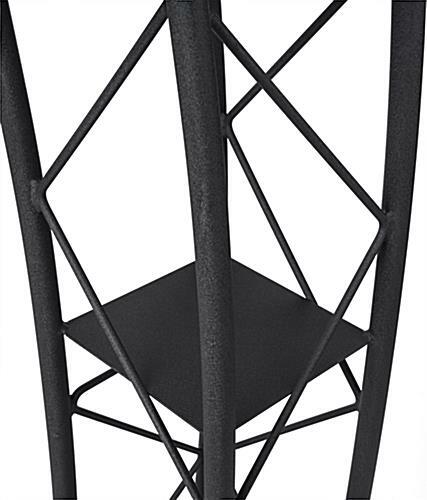 Each sturdy industrial-style speaking fixture is made of aluminum and steel and finished with a textured black powder coat for a neutral look that will complement any decor. 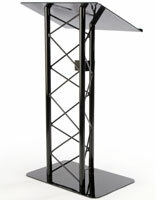 The curving design of this 45.5" tall box truss lectern includes an angled 23.5"w x 16.5"d reading surface with 1" bookstop. 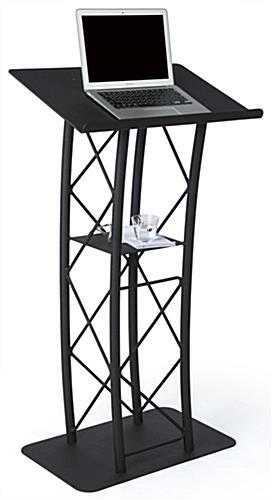 Each sturdy metal speakers podium features a fixed-height shelf for notes, beverages, or presentation accessories built into the framing. 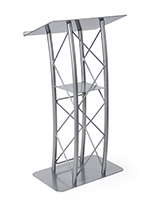 This type of modern truss lectern is a perfect addition to any conference hall, auditorium, church or place of worship, school or training area. 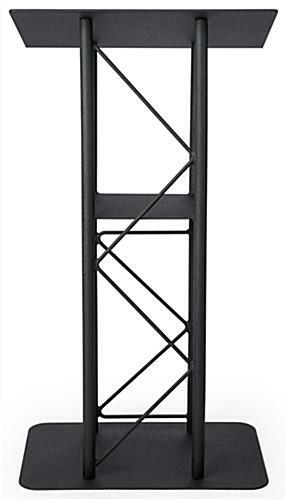 The black finish and industrial design will complement any commercial, professional or institutional decor, while focusing attention on the speaker. 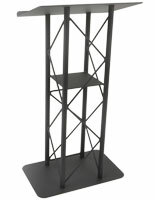 This stylish contemporary truss lectern's durable steel and aluminum rod construction will withstand daily use in any environment. 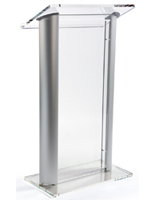 The high visibility podium is a perfect choice for corporate presentations, classroom or school debates and valedictory speeches, public speaking, sermons, preaching, and other ministry addresses. 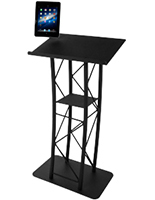 The curving lectern with black finish and wide flat base offers stability as well as style, but weighs only 59 pounds for easy movement when needed. 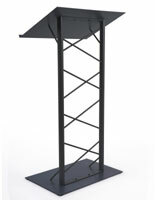 23.8" x 47.0" x 19.0"
This podium is the perfect height and perfect weight. 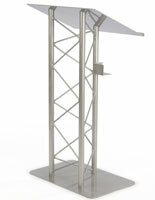 I'm a pastor, and the coating on this podium is perfect for not reflecting stage lighting! LOVE it! We love that you love it, Aaron! 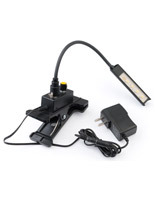 Thanks for shopping with us and taking the time to review. 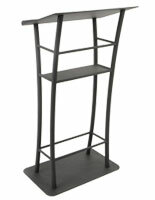 Great Podium, well built, sturdy and stylish! Weighted and evenly balanced. 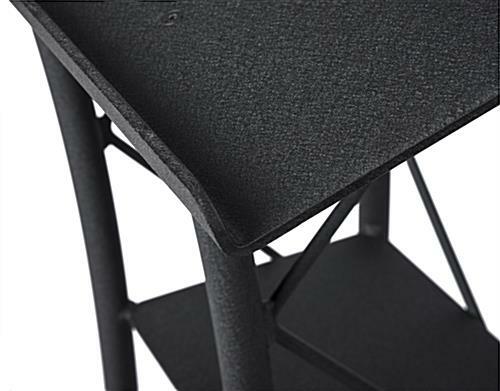 Perfect height and quality materials. Kind of on the spendy side, but well worth it!!! Would recommend this site to my friends and others!! !